As a general rule of thumb, some of the most interesting natural phenomena tend to be the type that most people have never heard of. “Prince Rupert’s Drop” is one such phenomenon that is almost certainly one of them. Once the fluid in the core is on the cusp of solidifying as well, it too shrinks. Only now, the outer layers have solidified, thus it can no longer adjust itself accordingly to accommodate the solidifying core. As you can imagine, the internal pressures start to rise. As they do, the insides start pulling on the outside equally from each direction, until the glass has built up an ample amount of energy just waiting to be released. 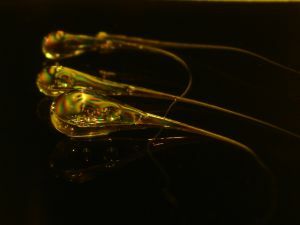 If you try shattering the thin layer of glass near the tail of the glass sculpture, you incite a chain reaction that sees all of this energy unload at essentially the same time, sparking a shockwave that makes its way throughout each part of the fixture bit by bit, disintegrating the material as it spreads. All of this goes down in a mere millisecond, so you can’t truly appreciate the view until you see this video. The people from “Smarter Every Day” show the incredible process happening at 130,000 frames per second. What’s even more amazing is the fact that this material is almost invulnerable (like, you can’t even smash it with the hammer) at every other section besides the tail, as these internal pressures essentially compress the surface and keep it held together, which,in turn, prohibits small cracks from growing into full-blown fractures. Are More Strict Science and Math Requirements Good for Students?